AMD's partners are eager to showcase their Threadripper-compatible boards before Intel comes back swinging with its own many-core CPU monsters. Consideration of a high-end platform means a straight choice between AMD's Ryzen Threadripper and the Intel Core i9 X line of chips. Both offer massive multithreading, but if it is a semblance of value you are after, the £900 Ryzen Threadripper 1950X, boasting 16 cores and 32 threads, is probably the best bet. And AMD has the advantage of having excellent platform connectivity thanks to the surfeit of PCIe lanes baked into each Threadripper CPU. 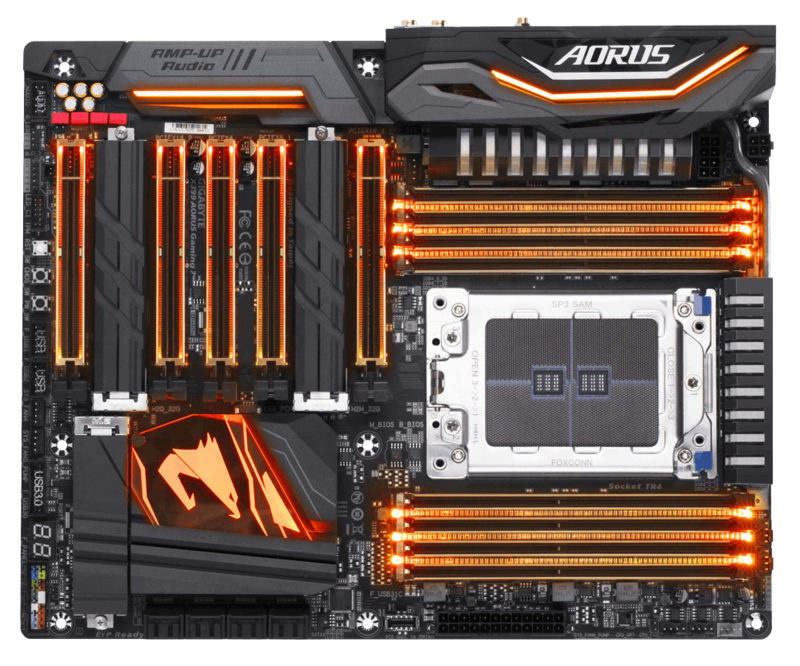 Aorus, naturally, is keen to get in on the act, so following up on our review of the Intel X299 variant, it makes sense to see how the same Gaming 7 TR4 board, costing £335, shapes up. Appreciating the high-level similarity between chipsets - massive socket, eight DIMM slots, heaps of M.2 and storage in general - there is little reason to reinvent the wheel. 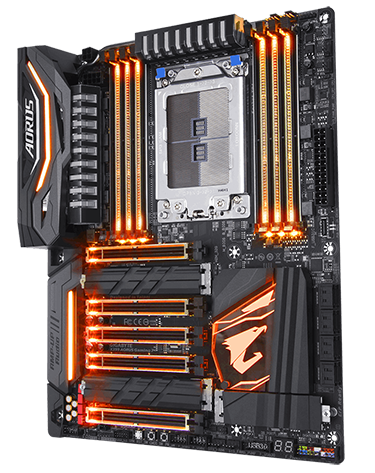 In fact, we're comfortable in saying that Aorus takes the same floor plan for this TR4 board, but that's no bad thing. As usual, the memory and PCIe slots are strengthened. 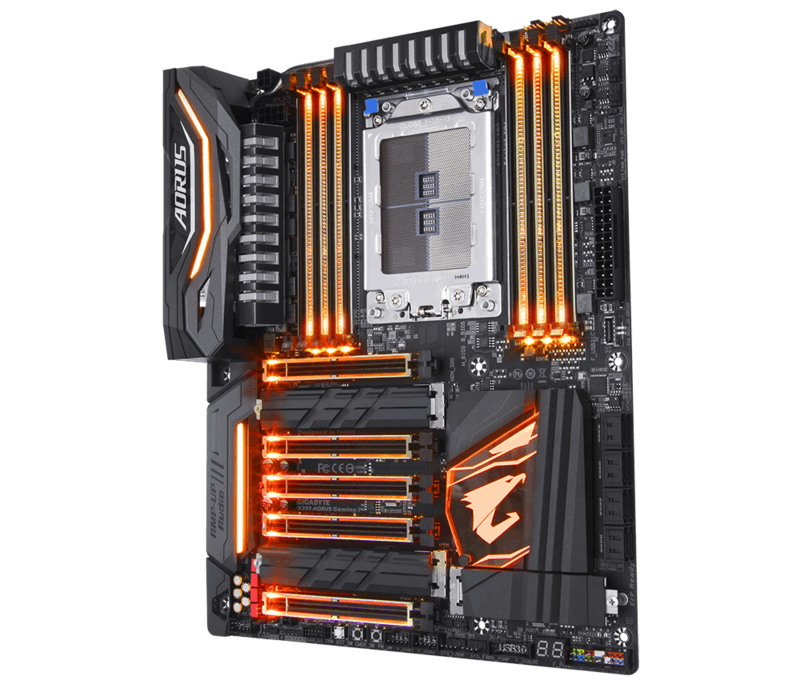 Aorus goes further than the similarly priced MSI offering by having RGB LEDs behind the memory, and you can tweak the colour to your heart's content via the Fusion utility. That lighting extends to the I/O heatsink (just below the Aorus name), PCIe, PCH, and audio, though bear in mind that the multi-zone lighting has to be the same colour throughout. If you like RGB, you will love this board, more so if you take advantage of the RGBW light strip headers. The only thing missing is the swappable overlay for accent LEDs, presumably because there just isn't any space for it on this standard-sized motherboard. The need to fit in lots of cooling around the CPU socket makes getting to the 8-pin CPU connector a tad difficult. On the other side of the heatpipe is a 4-pin connector - we usually see 2x8-pin on these kinds of boards - and we recommend you hook up your PSU cables before installing the chassis; otherwise it's a tight fit that takes a bit of wiggling to get into. Eight fan headers are actually standard fare on a high-end board, and there are a gaggle of them by the lower DIMM slots. We like this arrangement because you can clear the wires out of the way for a clean build. We think that a USB Type-C header ought to be present on all motherboards, thus forcing chassis manufacturers to catch up with respect to front-panel ports. 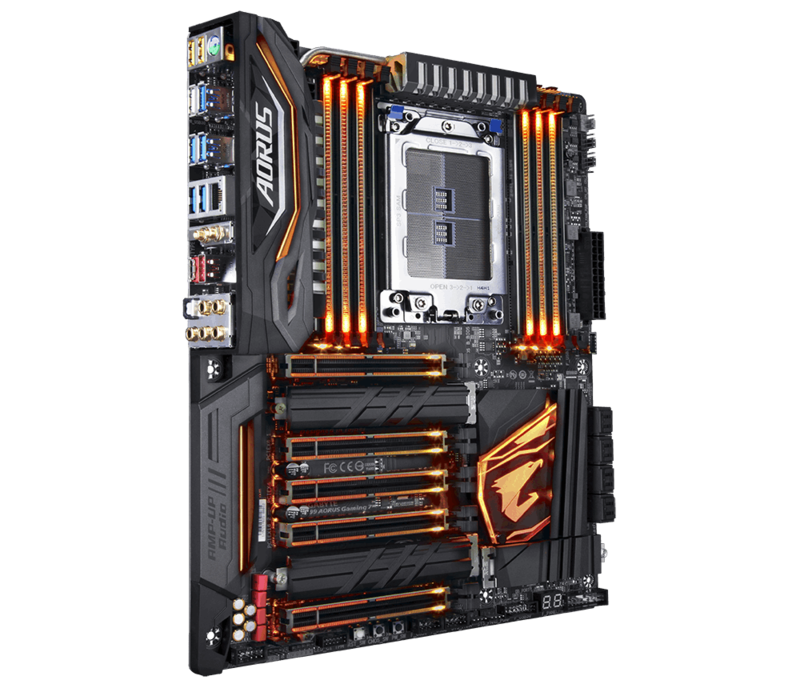 Aorus goes for the tried-and-trusted mix for a TR4 board, that is, 8x USB 3.0 from the chipset and 2x USB 3.1 (Gen 2) via the ubiquitous ASMedia 3412 controller. It drives the connector you see on the PCB. Moving over to storage, it is a similar story for a premium board. The chipset provides 8x SATA 6Gb/s ports located by the PCH. On top of that, tapping into the CPU and chipset's plethora of lanes, Aorus has a trio of full-speed M.2 (32Gbps). Two are 22110, sandwiched between the PCIe slots, whilst the other, a 2280, sits by the PCH and blends in from a style point of view. It has become fashionable to now use passive cooling for M.2; Aorus obliges. Speaking of PCIe, Aorus reserves 48 lanes for graphics goodness. Sensibly, the first and third slots run at x16 electrically and there's enough space between the two to house a double-width card. Putting four cards in results in an x8, x16, x8, x16 configuration, with all the lanes originating from the CPU. The fifth slot should be reserved for expansion, especially as the board doesn't feature any x1. Zooming into the slots shows that Aorus uses what it terms a 'double-locking' mechanism - the back of the card also clicks into place. Whatever the technology, a GeForce GTX 1080 feels snug and secure. What to do with any remaining space? Aorus adds in three small buttons useful if using outside of a chassis, with the clear CMOS being a good choice. There aren't many things more annoying than having to track down the clear CMOS jumper after a failed boot. A debug LED is always welcome and, like any good design, installing 12in-long graphics cards doesn't foul any features - there's just enough room between the card and USB 3.1 Gen 2 header by the ATX connector. 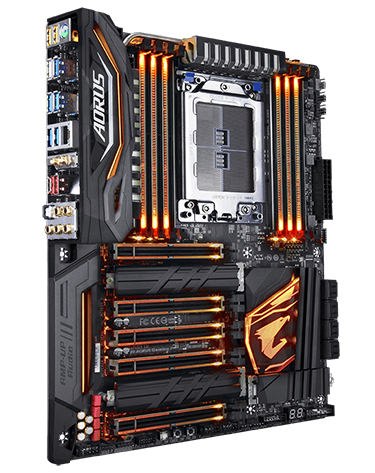 It will come as absolutely no surprise to learn that Aorus, like most, uses the Realtek ALC1220 audio Codec, firmly hidden behind the large heatsink and lighting. There's a tie-in with SoundBlaster 720, too. In fact, so much of the board is either covered by heatsink or, when fully populated, that you don't see much of the PCB. Though it is not advertised as such, it looks more like a semi-ruggedised mobo than most high-end models. The X399 chipset, meanwhile, also provisions for both USB 3.1 connectors - Type-A and Type-C - on the back. You won't see Thunderbolt 3 run through them, sadly, but there is hope for the future as Intel has now made it royalty-free since May 2017. Manufacturers differ more with respect to networking than anything else, we believe. Some go down the Intel-only route. Aorus prefers to spend some of its networking cash with Killer Networks. You receive the E2500 Gigabit LAN chip. However, for some reason, it doesn't go with the same company for 802.11ac WiFi (the board uses Intel AC8265 instead), meaning there is no 'DoubleShot Pro' mode whereby the Killer WiFi and Ethernet are combined for speeds of up to 1.867Gbps. A cost-cutting measure, perhaps? 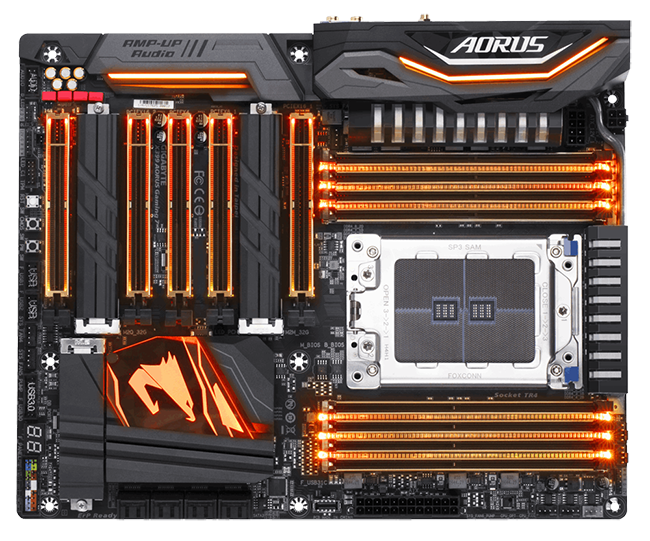 Overall, the X399 Gaming 7 is a board that is unmistakably Aorus. Let's now see how it benchmarks.